This season, I got together with designers Rosemarie Abela and Yana’s Jewellery to compile a fashion lookbook video to showcase 5 outfits from their collections. We have shown the looks in a number of blog posts this month on my blog site at graziellecamilleri.com, so as to conclude this fantastic collaboration, we are happy to also release a lookbook video because we wish to showcase the looks in a more animated way. We enjoyed creating this lookbook and if you are a fashion house or designer, lookbooks similar to these, even if created within your budgets, can be excellent marketing or PR tools for your business. Q: So, Grazielle, what is a lookbook video, exactly? A: Firstly it is important to familiarise yourself with this fashion term, including, ‘lookbook’. A lookbook is a collection of images that show models styled and wearing the items from your collection. 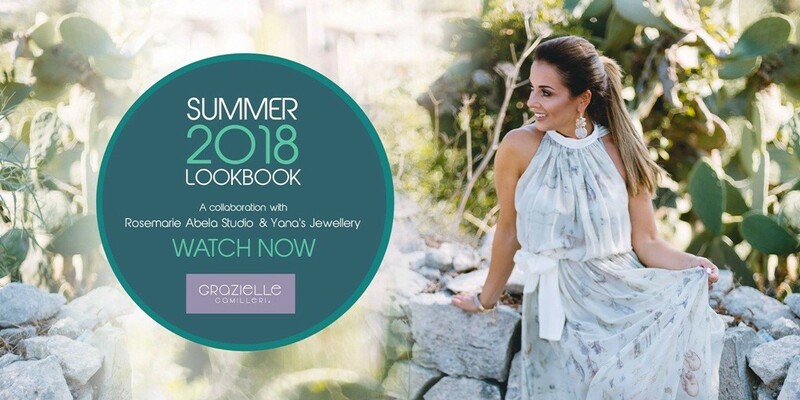 The point of the lookbook, (be it digital, printed or in video format) is to inspire customers with your brands aesthetic and give them ideas about how to wear your collection. A look book can really help demonstrate to your intentional audience and an appealing direction to potential buyers. When put into video form, it puts life into your vision and allows viewers to see how your items move. It also further demonstrates your fashion viewpoint and creates a specific mood for your collection. Fashion videos are extremely fun to shoot and plan! Despite the sweltering heatwave the particular shoot day, we had a lot of fun piecing it together and driving around the island in my car stopping at sites for the filming with some awkward changes along the way. That’s all part of the fun! When preparing a lookbook, I suggest you consider what format you’d like for your collection before approaching a photographer or videographer. Are you more interested in creating one with a narrative with an explanation in the background, or would you like a brief video with only music? Look and Google online to get inspiration from other designers or bloggers and have fun with it. This was my first lookbook per se, as my previous videos were part of a travel blog. I have learnt how to do it and next time will hopefully be better! We hope this article has helped inspire you and your own fashion video lookbook. Enjoy creating stuff! It’s what we are here to do!